Royal Caribbean’s creative thinkers are never short of an idea or two to capture our imaginations when they launch a new ship, and 1887: A Journey in Time is true testament to that. A brand new ice skating performance, the show will feature world class skaters exploring love and adventure in a re-imagined version of Paris in the late 19th century. The show has been described as having a steampunk aesthetic, and has clearly been influenced by French author, Jules Verne, best known for his works Journey to the Centre of the Earth, Twenty Thousand Leagues Under the Sea, and Around the World in Eighty Days. Following the fortunes of protagonist, Juliet, the story starts on the famous Parisian waterway, the River Seine, as she journeys with her mysterious time-travelling companion, the Tempus. Juliet and the Tempus travel through multiple dimensions and time, uncovering the secrets of the world, and of the heart. Skilfully performed atop the ice rink in Harmony’s Studio B; 1887: A Journey in Time will be complemented by stunning state-of-the-art multimedia visuals and a captivating audio track. The visual effects have been created by the Luminous Creative Imaging team – helping to blend reality with fantasy right in front of the audience’s eyes. There will certainly be no shortage of entertainment aboard the Harmony of the Seas, with an impressive roster of shows performed alongside 1887: A Journey in Time. As well as Grease, the ship will also play host to Columbus: The Musical!, a hysterical imagining of the life of Christopher Columbus’ distant (if slightly fictitious) cousin. More than a hint of Spamalot is present in this madcap show. 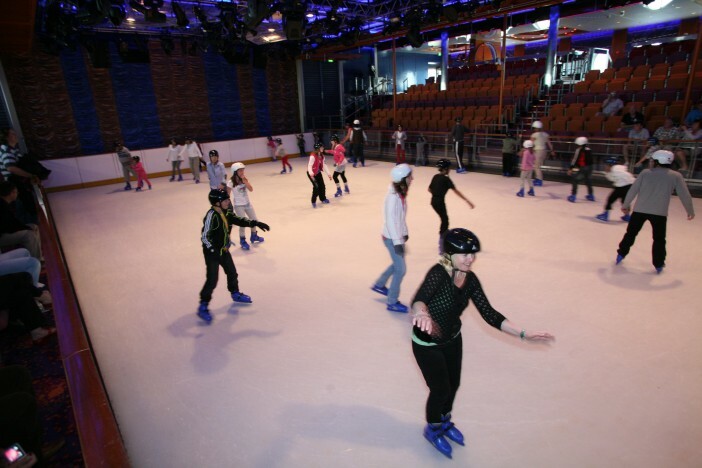 And 1887 will not be the only ice skating show performed aboard Harmony of the Seas, with Studio B also providing the setting for iSkate Showcase, where the skaters take control. Bored with skating the same tired routines to the same old music year-after-year, a band of rogue ice skaters have decided to take control in iSkate, and perform their favourite moves to their favourite tracks. There’ll also be a chance for guests to lace up their boots, and try out their best moves upon the on-board ice skating rink – great fun for all ages. If you’re looking for an unforgettable journey aboard Harmony of the Seas this year, visit our dedicated page here. Alternatively, call our friendly sales team on 0800 230 0655 for the full range of deals.